GHSA’s report was funded completely by the Foundation for Advancing Alcohol Responsibly (www.responsibility.org) and is titled “Drug-Impaired Driving: Marijuana and Opioids Raise Critical Issues for States.” The report was quickly broadcast across mainstream media outlets who are also largely funded by the alcohol industry’s advertisements. Curiously absent from the media coverage though was the fact the report was entirely paid for by Responsibility.org. Nearly all of the “recommendations,” if implemented, will lead to increased mass incarceration of the U.S. populace, which already has the largest prison population in the world. The recommendations could lead to more completely innocent and unimpaired drivers being jailed by, as The Free Thought Project has reported on numerous occasions, so-called Drug Recognition Experts. The costs of more DUIs will only enrich lawyers, drug-testing programs, probation companies, and vehicle-installed DUI device corporations. Additionally, research indicates that THC tests of saliva and THC-blood levels are no indication of impairment and can remain in a person’s system for up to 30 days following consumption. While the GHSA’s report appears to be concerned with “highway safety,” it relies on highly subjective and unreliable data to arrive at its conclusions and subsequent recommendations. In 2016, 43.6% of the drivers with known drug test results were drug-positive. In 2015, of the drivers with known test results, 43.0% in the annual report le and 43.4% in the nal le were drug-positive. Of the drivers with known alcohol test results, 37.9% were alcohol-positive (any alcohol at all) in 2016 compared to 38.0% in the 2015 annual report le and 38.1% in the nal le. Citing the National Highway Traffic Safety Association, Forbes reported that not only is marijuana use safer than alcohol use when it comes to driving, but far fewer fatalities are recorded when marijuana is present than when alcohol is present in traffic fatality instances. “It looks like marijuana’s impact on traffic safety has been greatly exaggerated,” writes Forbes. Those tests employ a blood level-based judgment similar to that used for determining alcohol impairment. 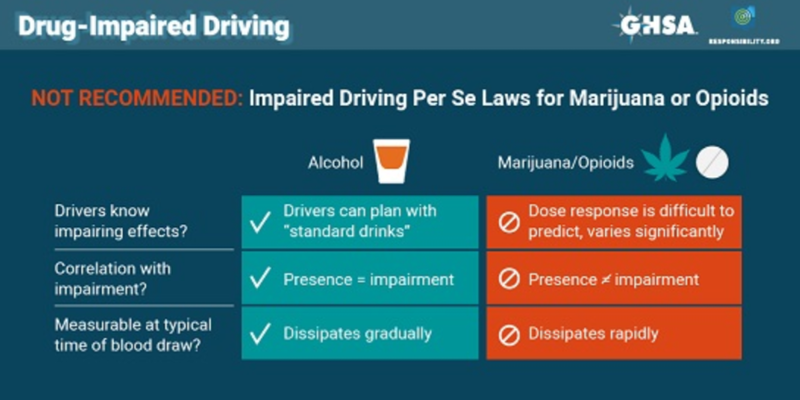 But AAA found such tests for THC are wholly unreliable—sending potentially unimpaired drivers to jail and putting impaired drivers back behind the wheel. Not only does it appear that the GHSA’s statistics are flawed, but it is also clear that they do not align with other non-biased organizations’ conclusions. However, one of the most disturbing issues that have been revealed by this report is the fact that the alcohol industry is training law enforcement officers, prosecutors, and lawyers on how to detect, charge, litigate, and prosecute cannabis users in the judicial system.